Despite steady employment and income growth, would-be buyers still aren't able to afford homes. The Bureau of Labor Statistics’ (BLS) April and May employment reports left economists white-knuckled as they waited to see if the lull in job growth was a temporary situation or an ominous sign of things to come. Thanks to a robust June employment report, economists released a sigh of relief. The June 2017 Employment Situation Summary from BLS shows that total nonfarm payroll employment rose by 222,000 jobs last month. This month’s report pushed April and May’s readings up by 47,000 jobs, something National Association of Realtors (NAR) Managing Director of Housing Research Danielle Hale says is a signal that the “apparent weakness” of the last months of spring was a “blip” due, in part, to late data reporting. Although the unemployment rate rose slightly in June by 0.1 percentage points to 4.4 percent, Hale says she isn’t particularly concerned because of the increase in the labor force and the strength of other labor market health measurements. Before real estate professionals get too excited, there’s a small caveat to the strong jobs and income growth — it’s great, but still not enough to keep up with skyrocketing home prices. “Continued labor market health and additional spending power for workers is good news for the housing market, but even with the higher weekly earnings growth seen in June, home prices continue to outpace income growth,” she said. Realtor.com Chief Economist Joseph Kirchner, Ph.D., echoed Hale’s sentiments and said the decline in affordability minimizes the positive impact this report would have on the housing market. “However, as many prospective home buyers know, it’s not all good news: The combination of strong home price growth and lack of earnings growth means that homes will continue to get less and less affordable,” Kirchner said in a statement. Once again, the main solution to the issue of declining affordability will be increasing for-sale housing starts, a process that isn’t moving nearly fast enough. “This suggests that we will continue to make slow progress on construction and increasing the inventory of homes available for sale,” she added. In June, the pool of unemployed individuals grew by 100,000 people, resulting in a total of 7 million. Diving into the major worker groups, the unemployment rates experienced little or no change from May. Asian unemployment rates stayed unchanged at 3.6 percent, and Hispanic unemployment took a 0.4 percentage point dip to 4.8 percent. 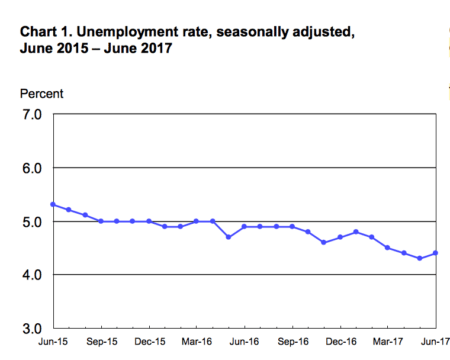 The number of long-term unemployed individuals remained stable in June at 1.7 million, making up 24.3 percent of the unemployed total. The labor force participation rate (62.8 percent) and the employment population ratio (60.1 percent) remain essentially unchanged from May and have been holding steady for the past year. Workers employed part-time for economic reasons — in other words, individuals who would prefer to find full-time employment — rose by 100,000 to 5.3 million last month, but the number is still lower than June 2016’s 5.7 million mark. Last month, there were 1.6 million people considered marginally attached to the labor force, meaning they are available for work and want a job, but are not currently in the labor force. This is mostly unchanged from a year prior. The number of discouraged workers, who have indicated that they are not looking for work because they do not believe jobs are available for them, jumped by 12,000 year-over-year to 514,000 total.